I must admit that I'm not crazy about chicken as I find it too blah and bland.. Also my sister and best friend both religiously don't eat chicken, so that has certainly rubbed off on me a little over the years.. 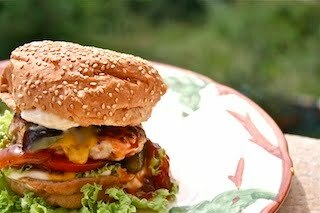 So for chicken to tempt me, it needs to be crisply roasted or in a juicy burger like this one.. And this is a much tastier chicken burger than the usual ones, due to the Asian twist in my opinion.. Plus, the great thing about this recipe is that if you feel like having a lighter burger, this is the one! Just don't add mayo and opt for a whole-wheat bun instead..
accompaniments: burger buns or whatever bread you like, some sweet chili sauce, mustard, mayo, pickles, lettuce, tomatoes etc..
Chop the chicken breasts into small cubes and add them to a bowl.. Add all the above ingredients and give everything a good knead with your hands.. Then form the chicken mixture into patty shapes and fry them for about 1-2 minutes on each side.. In the meantime, toast your buns and add the condiments you like, but don't forget the sweet chili sauce - it fits beautifully.. Enjoy!